Great news for spring time when we can all get outdoors and enjoy springtime in the orchards. 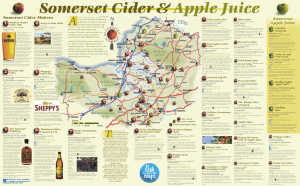 Where better than Somerset, the birthplace of real cider. The new producers are Worleys Cider, Tricky Cider Company, Orchard Pig, Ashill Cider, Honey Pot Farm Cider & Apple Juice, Lawrences Cider, Gold Rush Cider and Barrington Court. Burrow Hill Cider and the Somerset Cider Brandy company have won a Protected Geographical Indication – making them the only legal distillers of Cider Brandy in Europe. They also won bronze for their medium cider at the 2012 CAMRA Champion Cider awards. Download the map here – Link to Google docs. Or pickup from the tourist office in Somerset.